This is actually a post about a series of nine related images, so you can consider my nomination about the first in the series if that works better. 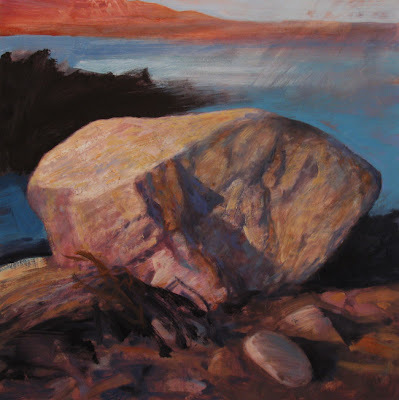 Why I chose the piece, and the series, for this category is that it's expressly about "still life," i.e., the life force in still stones, as well as being an outdoor object portrayed for its own sake and not about the place it was found, so it stretched my idea of what a still life might be about in an interesting way. Why I like the piece is that apart from being a beautiful example of making the commonplace extraordinary with paint and vision, it also is the artist's effort to stretch his own style and his audience's expectations, so it's also an image of artist courage. Thank you, David and Katherine, I deeply appreciate this honor. I hope you win in the still life catagory. Todays blog painting is great. I loved what David had to say. Very insightful. You deserve this nomination. What a validation for this sensational series, the voice of your soul. Congrats Don. Your work deserves all the awards and recognition it gets. I truly love looking at all you create. Thanks for sharing with all of us. Hope to see you and Brenda on New Years Eve, even if you leave after "Herb and Dorothy"
you absolutely deserve those words and recognition for contribution to art and inspiring others Don. best wishes r.
Great stuff Don. Congratulations on this public recognition which you thoroughly deserve. I love David's phrase of "artistic courage" ! What a nice thing to say, Katherine--thank you! Hey Bri, thanks. We hope to make the party--sounds like a great time will be had by all. Rahina, I thank you so much. Happy creating in 2010! Sheila, I appreciate it. David's comments made me think differently about the painting myself, and that's a real gift. Happy 2010!